Broadwell is the codename for Intel’s fifth-generation CPUs. They are the successor to Intel’s Haswell-based processors, and there are only two Broadwell CPUs that are designed for the desktop – the Core i7-5775C and the Core i5-5675C. Broadwell processors are designed to work with socket 1150 motherboards that have Intel’s Z97 and H97 chipsets, and they are not compatible with eight-series chipsets, such as Z87 and H87. The latest Intel Broadwell based CPUs feature the most advanced onboard graphics engine ever, Iris Pro Graphics 6200, and these chips are compatible with dual channel DDR3 RAM. Read on to learn more about the top-rated, best-performing gaming motherboards that we believe these are some of the best Z97 motherboards for Intel Broadwell processors. 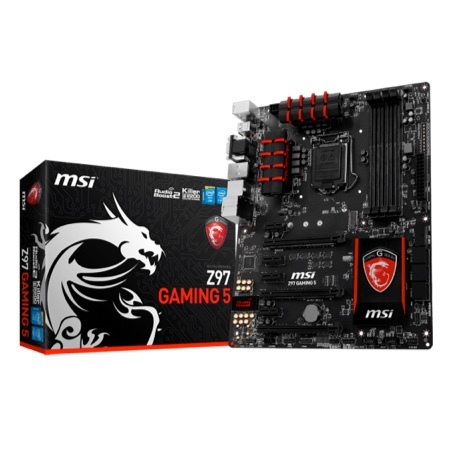 If you are looking for a solid motherboard that doesn’t have an abundance of features that you will never use, the MSI Z97 Gaming 5 is the board for you. The M.2 connector, six SATA 6Gb/s connectors, and six USB 3.0 slots ensure that there are more than enough connections available for the average gamer. Throw in the Audio Boost 2 sound system and the Killer E2200 networking port and this board has everything you need for extreme gaming, without all the unnecessary bells and whistles. It also looks stunning thanks to the striking red and black color scheme that we have grown to love from MSI, complete with the dragon emblem and logo. A simple BIOS which features one-click overclocking for CPU and RAM makes it easy to adjust voltage and timings. The Extreme Tuning Utility makes all this very manageable. Overall this is a stand-out motherboard, and the mid-range pricing means that it is one of the best value Z97 boards on the market. 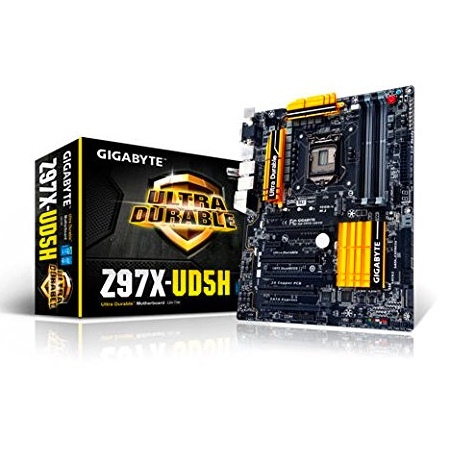 The Gigabyte Z97X-UD5H motherboard is a mid-range model designed for the casual enthusiast who is not too concerned about overclocking, although there are good overclocking features, such as a DualBIOS switch and voltage read points. The board also features a power/reset button with a two-digit debug display to help troubleshoot any problems. This ultra-durable motherboard is made with high-quality components such as 15-micron gold sockets and 10K black capacitors. GIGABYTE is trying to get the message across that this is a strong board that will last a lifetime. The design is also refreshing, with the mustard yellow color complimenting the metallic components and adding to finished clean, uncluttered look. While most other boards in this price range have to choose between SATA Express or M.2 support, the Gigabyte Z97X-UD5H has both, increasing your storage options. With a lightning-fast start-up time and low power consumption, the UD5H is one of the best Z97 motherboards for your Broadwell or Haswell CPU. 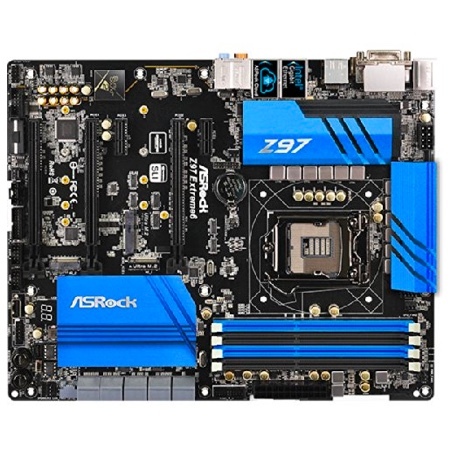 The ASRock Z97 Extreme6 is in the high-end category of socket 1150 motherboards and caters for enthusiasts who are serious about overclocking. The two desktop Broadwell processors, the Core i7-5775C and the Core i5-5675C, are both unlocked so this means they are given access to a range of advanced overclocking features through the motherboard’s BIOS. There is an abundance of storage options with ten SATA 6Gb/s ports, two M.2 ports, and two SATA Express ports. There are also seven fan headers, which is adequate. The BIOS is a joy to use, and the quick boot-up time is an added bonus. The ASRock Z97 Extreme6 motherboard is not recommended for beginners, and if you don’t plan on overclocking, then there are much more suitable and affordable options on the market. However, it is perfectly suitable for those who like pushing their machine to the limits. If you want extreme overclocking, then this Z97 board is for you.